The Vedic Eco Village will imbibe principles of Permaculture, Natural Farming and Cob Building promoting a simple and sustainable lifestyle centered on land, cows and Lord Krishna. Our focus area is hence to widely disseminate, train and demonstrate such a culture for a rural community. Village technologies will be locally designed and sustainable. Energy independent technologies used to process the raw food from the farm,extract oil, lift water or in handicrafts. 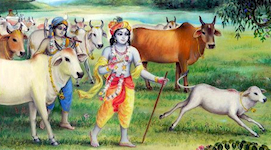 The Gurukula will have daily morning practicals that will include cleaning the asrama, cow care and agriculture.